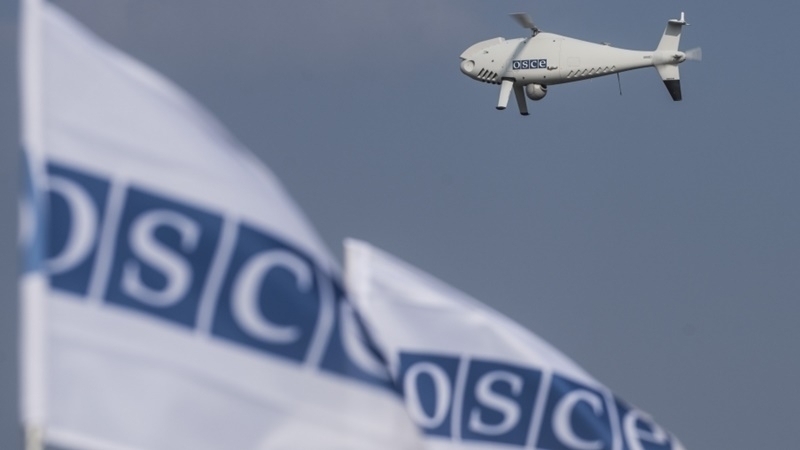 The long-range drones of the OSCE SMM recorded a significant concentration of heavy equipment of Russian occupation forces to the south-west from occupied Luhansk, according to the report of the OSCE Special Monitoring Mission in Ukraine. In particular, in the area of the settlements of Myrne, Ternove, Manuilivka, Kruhlyk, Miusynsk, Shymshynivka, on June 8, 126 tanks, 55 self-propelled and towed howitzers, and 55 infantry fighting vehicles were spotted. Although the equipment was located beyond the withdrawal lines, it was at the same time, outside the allocated armament storage sites (it should be noted that the OSCE SMM systematically reports the presence of heavy equipment in the vicinity of these settlements). “Beyond withdrawal lines but outside designated storage sites in non-government-controlled areas, on 8 June, an SMM long-range UAV spotted 34 tanks (24 T-72 and ten T-64) about 3.5km south-east of Ternove (57km east of Donetsk), 11 tanks (T-72) about 3km west of Manuilivka (65km east of Donetsk), 12 towed howitzers (D-30), eight self-propelled howitzers (2S1) and 12 tanks (T-64) about 6km south-east of Miusynsk, 22 tanks (13 T-64, seven T-72 and two undetermined) near Kruhlyk (31km south-west of Luhansk), six towed howitzers (D-30) and eight self-propelled howitzers (2S1) near Uspenka (23km south-west of Luhansk), 16 tanks (ten T-64 and six undetermined), five surface-to-air missile systems (9K35) and eight mortars (2B11 Sani, 120mm) south-east of Buhaivka, ten tanks (T-72) near Shymshynivka, and six anti-tank guns (type undetermined), 12 towed howitzers (D-30), nine self-propelled howitzers (2S1), 21 tanks (11 T-64 and ten T-72), 15 mortars (2B11) as well as about 55 infantry fighting vehicles (IFV) (45 BMP-1 and ten BMP-2) near Myrne (28km south-west of Luhansk),” reads the report. SMM further reports that the militants restricted observers limiting their work, especially in the south of the occupied Donetsk region. Thus, on June 9 in Sakhanka seven armed militants requested to see the SMM’s patrol plan. The SMM declined and the armed members told it to leave the area, although later on the same day the Mission patrol managed to reach the Sakhanka. The next day one of the militants told the Mission patrol that they had received orders from their "superiors" to prevent it from entering the eastern part of the village.. Moreover, on June 10, two militants did not allow the Mission patrol to the place where heavy weapons were deployed in the Donetsk region, citing that permission was needed from their “superiors”. And at a checkpoint located about 1.2 km north-west of the settlement of Siedove (non-government-controlled, 33km north-east of Mariupol), near the border with the Russian Federation, three armed members of the armed formations denied the SMM access to the village, saying that a special operation was ongoing in the area.